The Religious Affairs Ministry on Tuesday extended registration time till March 21 for hajj aspirants, who are interested to go to Makkah for performing hajj under the government management this year. The ministry took the decision of time extension as the quota of hajj pilgrims under the government management still remains vacant. The people, who earlier named in the pro-registration list from the serial no 22,765 and then, have been asked to complete the registration process within March 21, 2019 to go to hajj under the government management. They are also requested to submit their passports to the offices concerned before March 20 for verification. 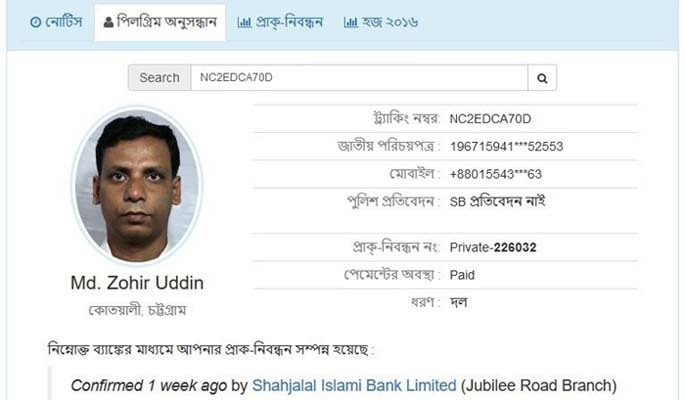 Those who did not complete pro-registration, but want to perform hajj this year, have been asked to submit written applications to the director of Hajj Office, Dhaka, through email [email protected] or [email protected] or inform it dialing 09602666707.